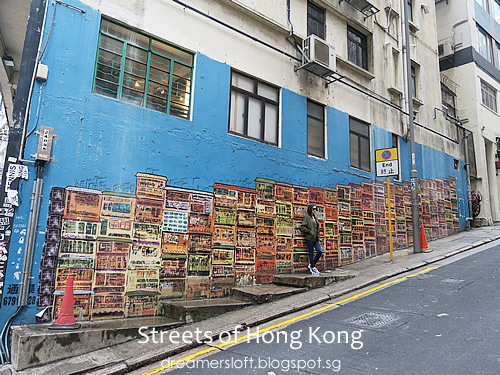 Prior to this trip, I never had the chance to stroll along the quieter neighbourhoods or notice anything interesting sights around the streets. Was always rushing around, eating and shopping. 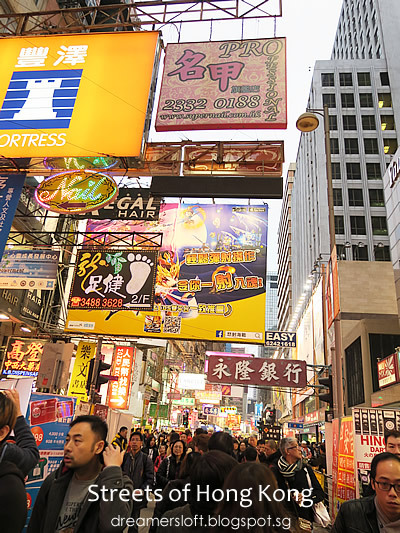 Indeed it became an eye-opener for me, to finally notice a different side of Hong Kong, a more charming and charismatic one amidst the commercialisation of it all. 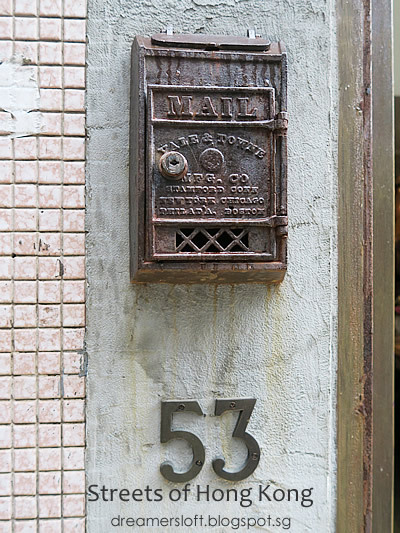 Was strolling along a random street (I think somewhere near Shanghai Street?) 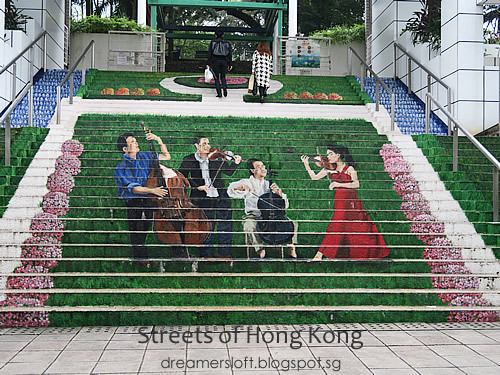 when I noticed this lovely flight of stairs with flora painting. A cheery sight indeed. 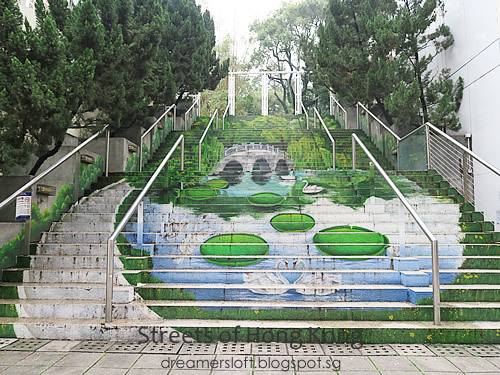 I think these flight of stairs lead to the Kowloon Park? A pity I didn't have time to visit the park which I heard is an oasis of tranquility amidst the hustle and bustle of Kowloon. 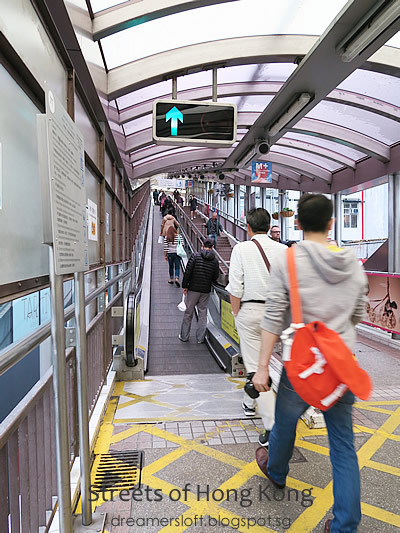 Couldn't believe this was my first time commuting via the famous mid-levels escalator of Central Hong Kong. 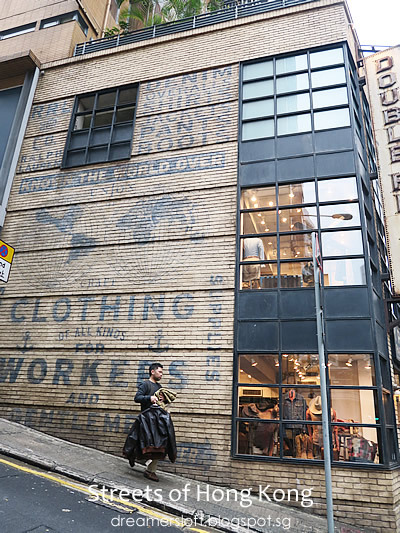 It's definitely more convenient and easy than walking uphill in the Central/Soho area, but the downside is, you'll missed the streets and sights of Soho area. I guess convenience is more important to the locals. Got off the escalators at some point and explored the streets of Soho area. Many swanky boutique and concept shops around the area. 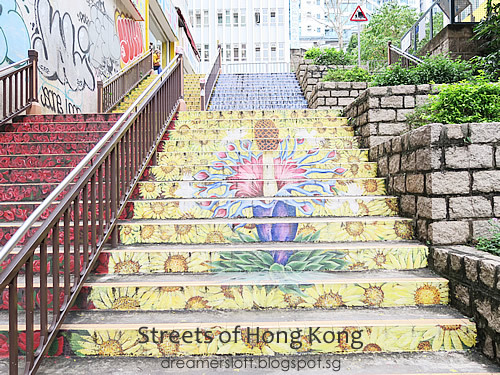 Bold murals created a different vibe to this area. 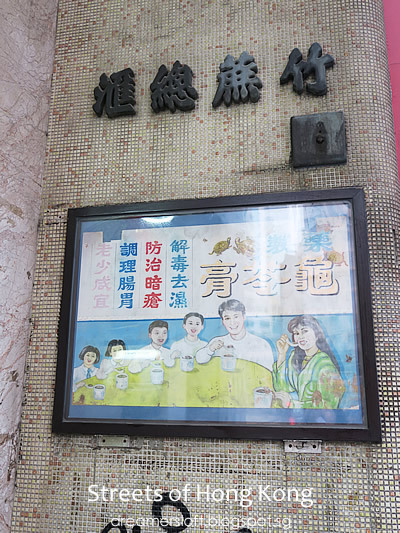 In contrast, old-school poster like this brought back a sense of nostalgia. 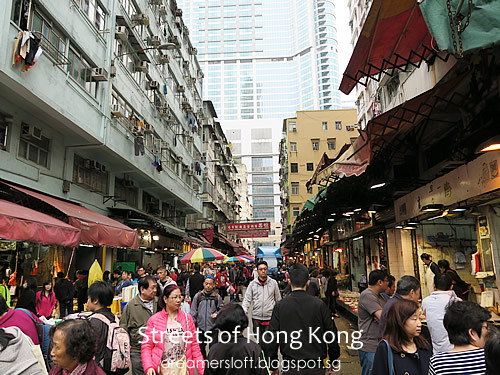 One of my favourite streets in Hong Kong, Des Voeux Road West, or known to the locals as Dried Seafood Street (海产街). 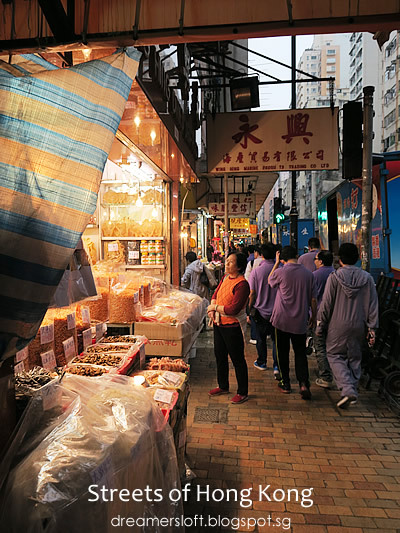 Besides topping up on dried seafood and herbal products here, I also love watching the trams that ply along this street. 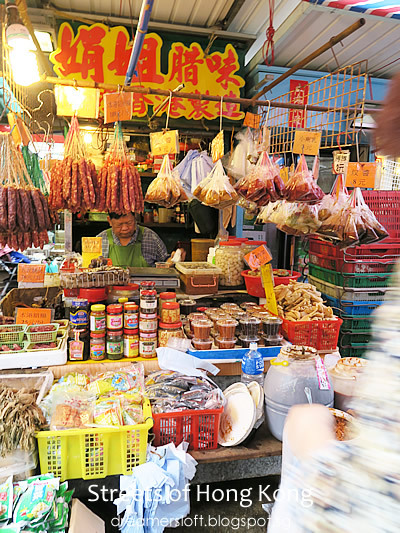 Buying dried seafood and herbal products here is quite intimating to me though, partly because the staff were mostly aggressive, and because of my poor Cantonese which posed a problem when I tried to ask questions or prices. I guess just have to be thick-skin. Was walking along Queen's Road West when I came across this large tree that's inclined at 45 degree angle. 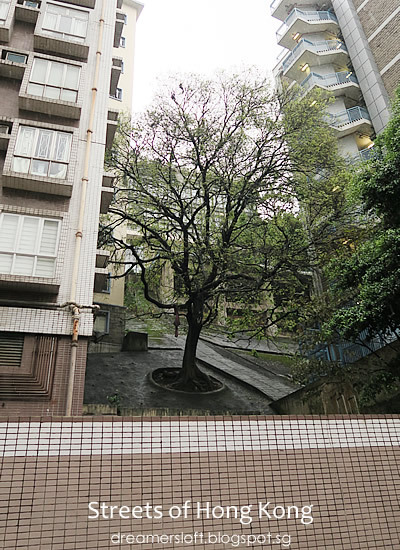 In fact, inclining trees are a common sight in Hong Kong island due to the hilly terrain. Just found it amazing. 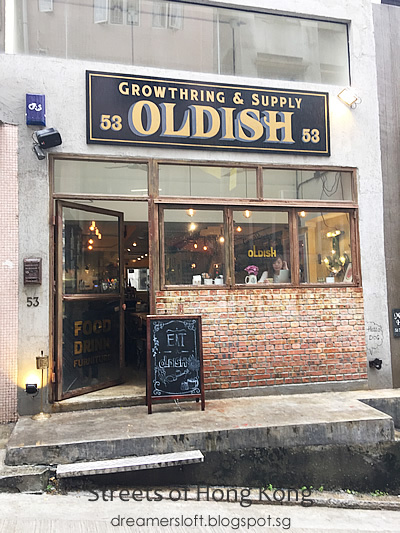 Charming restaurant/cafe along Tung Street, which is near Tai Ping Shan Street. I was on my way to teakha I and chanced upon it. 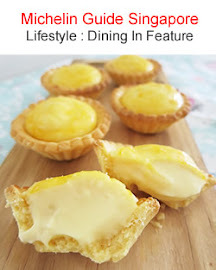 Took a peek at the interiors and I love the vintage furnishings and ambience! Alas I was too full so didn't have chance to go in for a meal. Next trip! 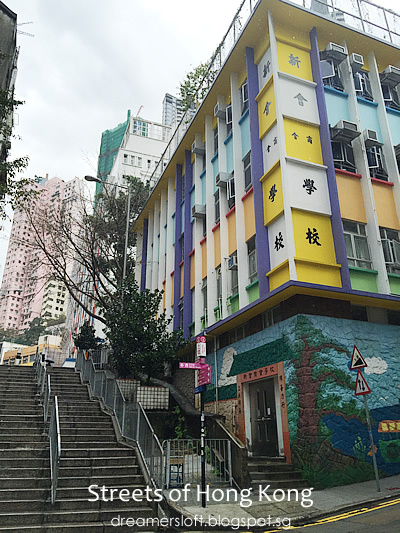 School near Tai Ping Shan Street. Lovely colours and murals. 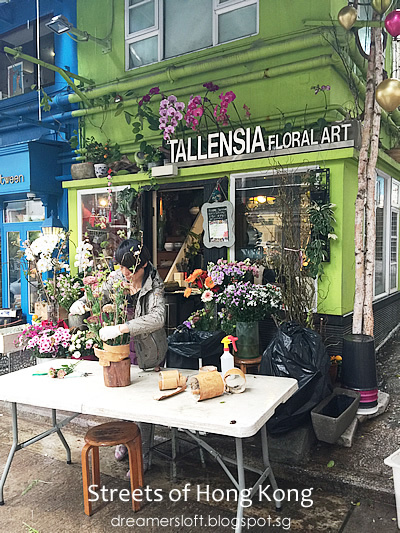 Charming florist at Tai Ping Shan Street. 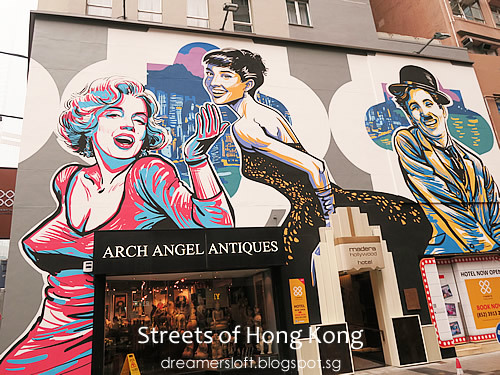 Later on when I read more about Tai Ping Shan Street, realised this area is fast becoming another trendy and hip place with many cafes and concept shops popping up. Next time I must visit again and take my time to stroll around the area. 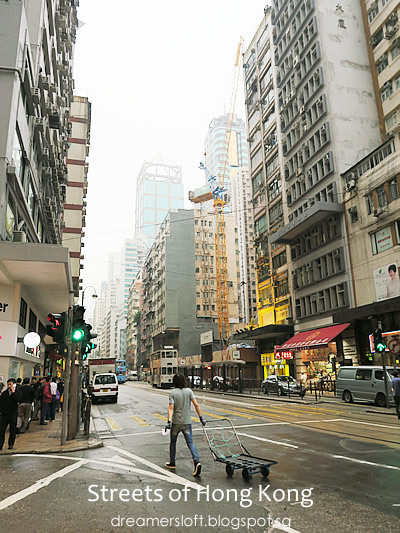 The famous Ladder Street of Sheung Wan. 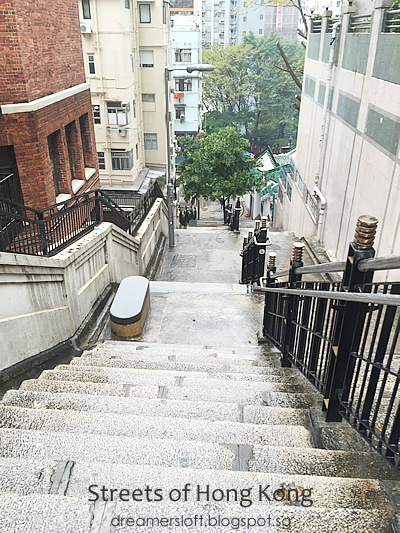 I heard that before the mid-levels escalators were constructed, locals used to access the mid-levels district/Tai Ping Shan through this Ladder Street. Not sure how many flights of stairs there are (a few hundred?). Luckily I was at the top of the stairs and walking down, instead of up! Shot taken en route to Olympian City, West Kowloon. 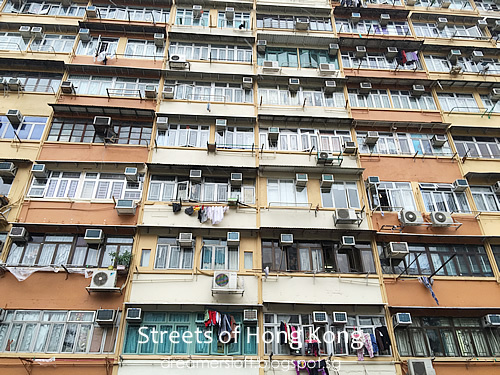 Blocks of housing like this is a common sight in Hong Kong. Saw the "cubes/box" installed on top of windows at every household interesting. Wondering what they are? 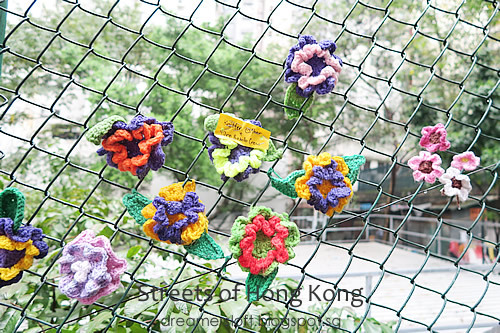 Saw these pretty yarn crochet tied to the fence along Ladder Street. 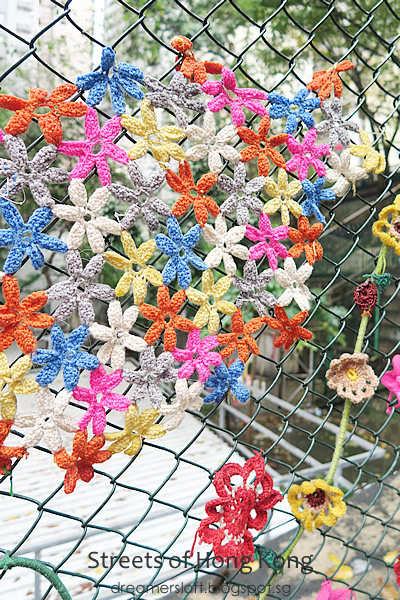 Certainly spruce up the otherwise boring old fence. 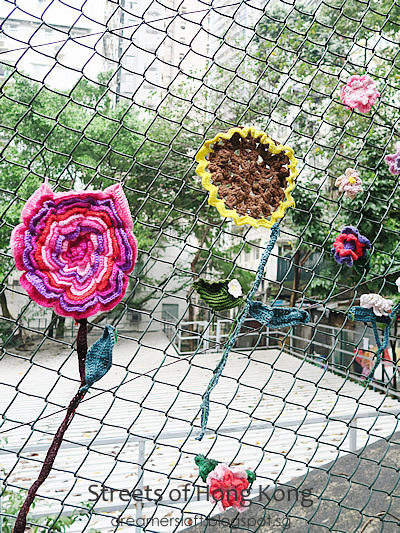 Apparently this is called "yarn bombing", originated in the US by avid street artists, and now spreading throughout the world. 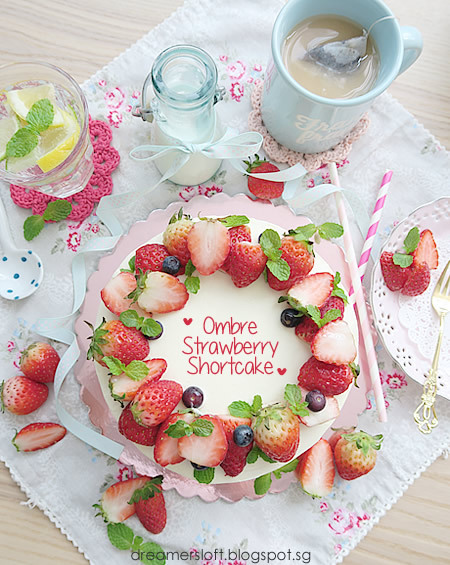 Hopefully I get to see this in SG. 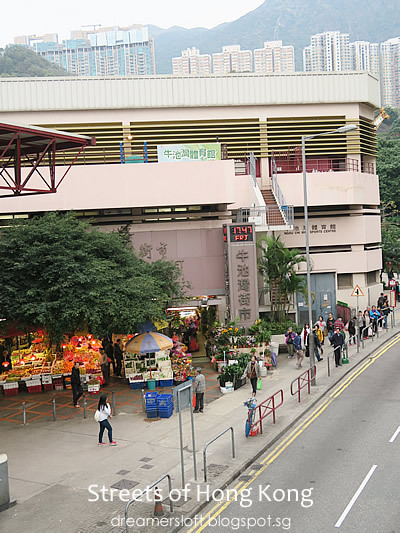 Open-air market in Mong Kok (near to Langham Place, whole stretch of street behind Reclamation Street). 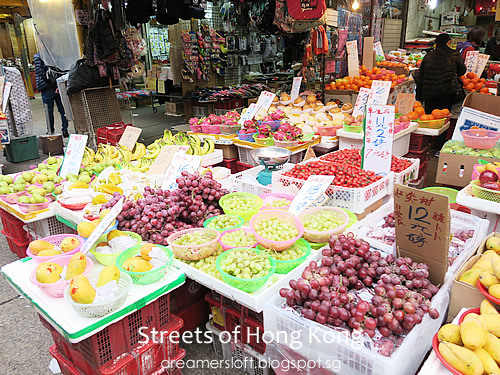 One of my favourite market to visit in Hong Kong, vibrant and crowded, but quintessentially Hong Kong. 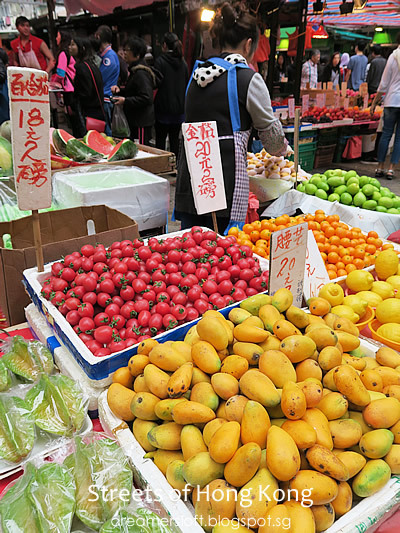 Lots of fresh fruits on sale. 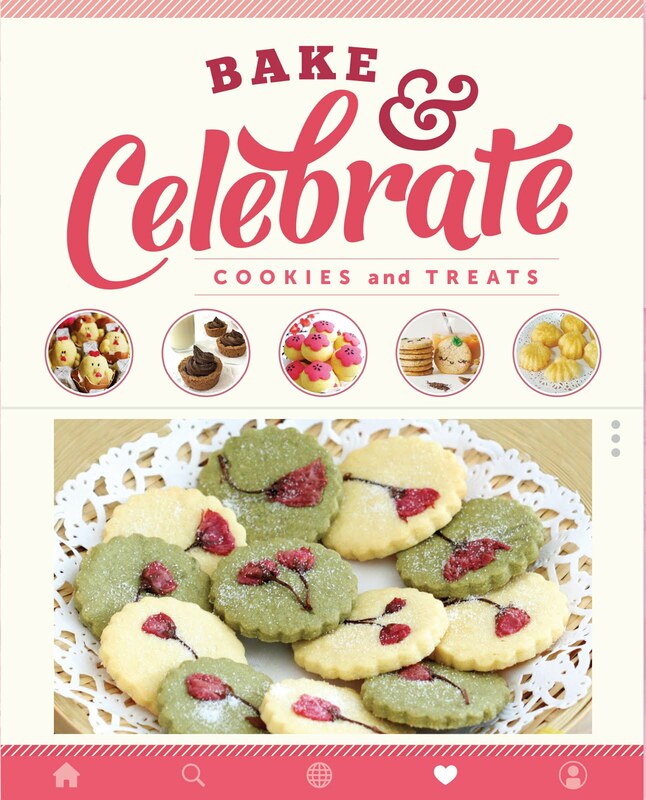 The greens available look so appetising, had to resist the temptation to buy. 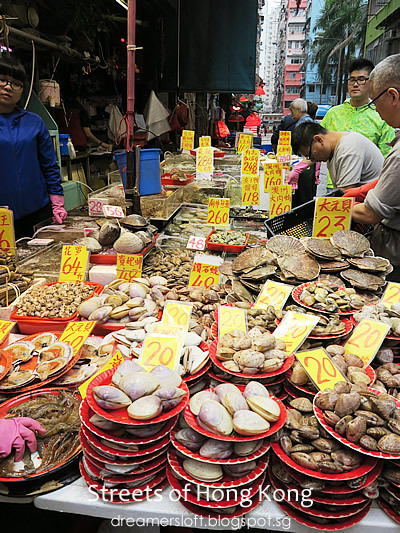 Discovered this wet market near Choi Hung MTR Station on our way back from Sai Kung. 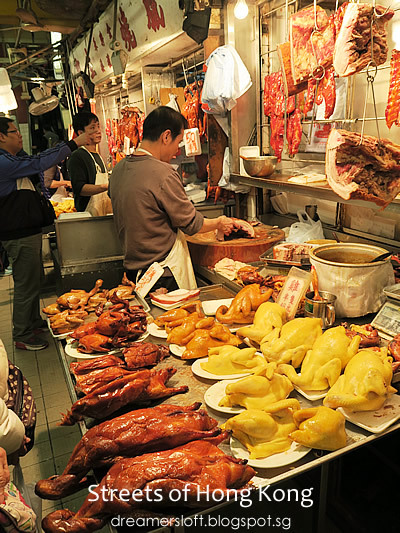 Roasted meats for sale. The hb insisted on buying braised pigeon. Freshly wrapped wanton for sale. 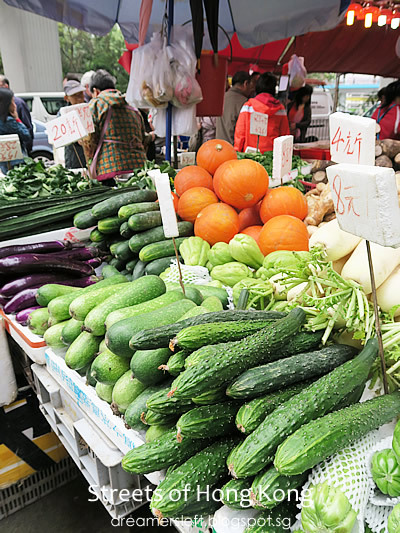 The prices of fruits and vegetables here were cheaper as compared to the market at Mong Kok, I guess since this is the outskirt. 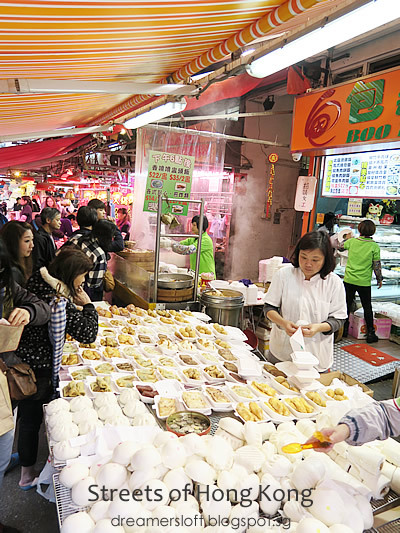 Large variety of dim sum for sale! 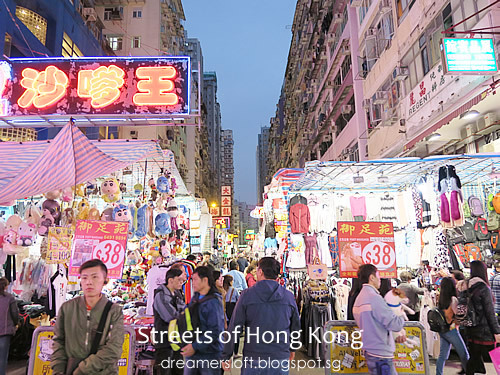 The street of Mong Kok. Still as exuberant, with the loud neon signs. 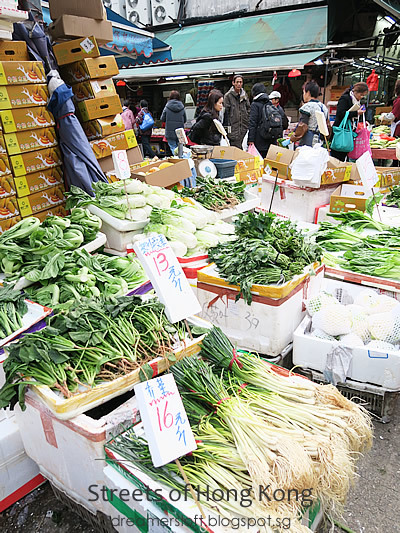 Ladies' Market has lost its appeal, well at least to us. 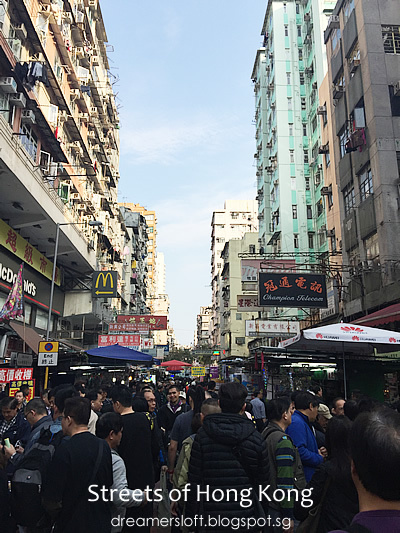 The last day before returning home, we spent a couple of hours at Sham Shui Po, selling popular electronics and value-for-money clothing, popular among locals especially during weekends. 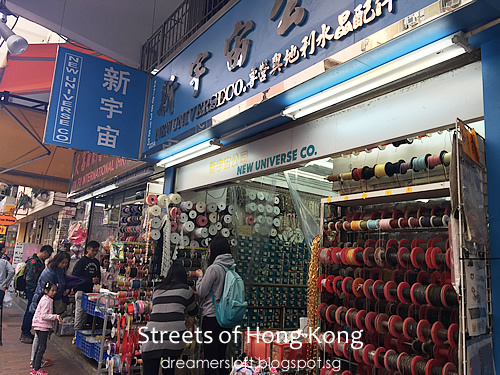 The accessories shops here at Nam Cheong Street and Yu Chau Street are a haven for craft lovers, as they are super stocked with all sorts of ribbons, trims, beads, buttons etc etc. 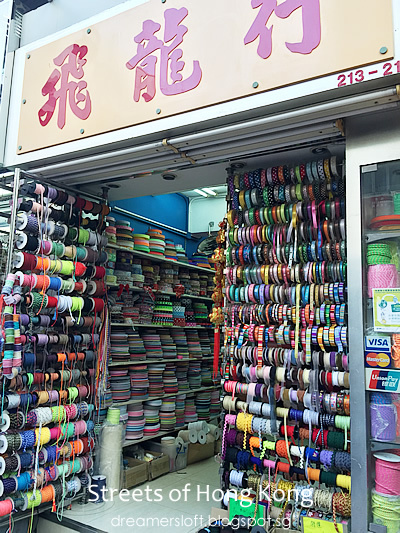 Heard that nearby there's a Ki Lung Street which is supposedly a fabric market. Didn't have time to venture there though. Very glad that I uncovered many new areas this time round and hopefully return for me next time!